Colette was always one of those writers who I had been aware of, and had yet never read. A recent Saturday morning trip to the library saw me finally bring home one of her slim little volumes (the only one they had available that day, so had no idea if it was the best one to start with). I understand that Colette is best known for her novel Gigi and her Claudine series of novels, but this novel despite its title is actually not part of that series. The famous Claudine series were published between 1900 and 1903, Claudine’s House is much later 1922, and is quite obviously heavily autobiographical, a dreamlike reminiscence for a lost time. Although the title features the name of Colette’s famous fictional alter-ego – the narrator of this novel is most often called ‘Little Darling’ and later sometimes Colette. 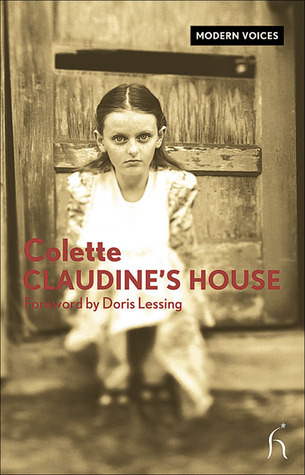 According to the introduction to this Hesperus edition, Claudine’s House cannot be seen as a normal autobiography, it is a novel, as in this book Colette has merged fact and fiction. Combining the everyday realism of rural family life with the more fantastic imaginative world of the child, Colette recreates an almost idyllic time in her own early life. A time she lived in the home of her childhood, and how beautifully Colette recreates that home for us. In the idyllic rural French countryside of the late nineteenth century Colette grew up surrounded by woods, in the midst of a loving family and with a host of much loved pets. It is this world that is so beautifully portrayed here. Her busy, capable little mother Sido, her one legged Captain father, her elder sister with her masses of long black hair and a seemingly unending parade of sneaky and mischievous cats and dogs. Colette was her mother’s favourite child, her ‘Minet-Cheri’ (Little Darling). Not knowing much about the woman Colette – I find it very hard, impossible perhaps to separate the fictional Colette (Little Darling) from the real woman, and writer of Claudine’s House. Surely, though we see in this novel a lover of the living things around her, the countryside that was Colette’s playground provided her with a wealth of things to do, and learn about. In Claudine’s House the narrative moves from the time of Colette’s early childhood to the time when she is herself a mother of a young daughter – Bel-Gazou. It’s the kind of book where the action is limited, gloriously so, this is the story of a precious time, a family, their anecdotes, observations of their neighbours and childhood games. Claudine’s House is also a delightful homage to the natural world, and to the freedoms enjoyed by Colette and her playmates. Into this almost perfect seeming world, Colette injects the odd note of sadness, in the recreation of her parent’s sometimes volatile relationship, her sister’s separation from the family following her unwise marriage, and just the barest hint of money troubles. This was such a delightful little book, both humorous and touching it is a deeply affectionate recreation of a childhood that must have been looked back on with very great longing. I really must read more Colette soon, but which should I try to get hold of next? Colette experts please advise.